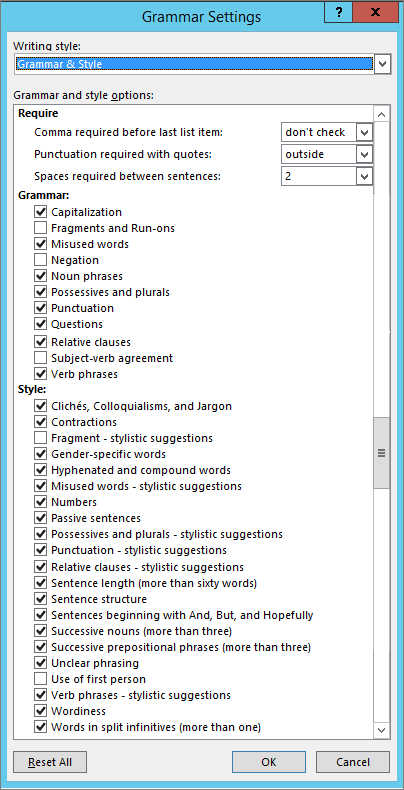 In Word and Outlook, you can change the types of grammar and style rules that the grammar checker uses when checking your writing by using the Grammar Settings dialog box. Common grammar and style settings include choices for detecting grammatical errors in capitalization, punctuation, and word usage, as well as style preferences for things like hyphenation, punctuation, and passive voice. Note: The following information applies to Office 2013 and earlier. 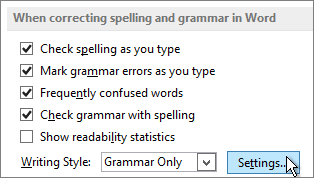 For information about choosing grammar settings in Office 2016, see Select grammar and writing style options in Office 2016. Word 2013 and Word 2010: Click File > Options > Proofing. Word 2007: Click the Microsoft Office Button > Word Options > Proofing. Outlook 2013 and Outlook 2010: Open a mail item, and then click File >Options > Mail > Editor Options > Proofing. Outlook 2007: Open a mail item, and then click the Microsoft Office Button > Editor Options > Proofing. 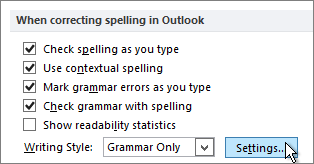 Under When correcting spelling in Outlook, click Settings. Important: In Outlook, make sure to open the proofing options from an open item, such as an email message or appointment. Otherwise, the Writing Style menu and Settings button will be unavailable. The Writing style menu in the Grammar Settings dialog box offers two options: Grammar Only or Grammar & Style. You can choose either option depending on which settings you want to work with. Scroll down to see all of the options available in your program, and select or clear any rules that you want the grammar checker to flag or ignore. See the tables below for an explanation of each option. Note: Any changes that you make to these settings apply to all documents or items that you edit, not just the one you are currently working in. Select don't check if you don't want the grammar checker to check for this issue. Select never if you want the grammar checker to flag as errors any sentences that include a comma before the last item. The following is an example of a sentence that the grammar checker considers incorrect with this setting: Please buy milk, crackers, and bananas. Select always if you want the grammar checker to flag as errors any sentences that omit a comma before the last item. The following is an example of a sentence that the grammar checker considers incorrect with this setting: Please buy milk, crackers and bananas. Select inside if you want the grammar checker to flag as errors any phrases within quotation marks where the comma is outside the quotation marks. The following is an example of a sentence that the grammar checker considers incorrect with this setting: While critics call the acting "inspired", they point out inconsistencies in the plot. Select outside if you want the grammar checker to flag as errors any phrases within quotation marks where the comma is inside the quotation marks. The following is an example of a sentence that the grammar checker considers incorrect with this setting: While critics call the acting "inspired," they point out inconsistencies in the plot. Select 1 if you want the grammar checker to flag as errors any sentences that have more than one space after the period. Select 2 if you want the grammar checker to flag as errors any sentences that have either a single space or more than two spaces after the period. Capitalization problems, such as proper nouns ("Mr. jones" should be "Mr. Jones") or titles that precede proper nouns ("aunt Helen" should be "Aunt Helen"). Also detects overuse of capitalization. Sentence fragments and run-on sentences. Incorrect use of adjectives and adverbs, comparatives and superlatives, "like" as a conjunction, "nor" versus "or," "what" versus "which," "who" versus "whom," units of measurement, conjunctions, prepositions, and pronouns. Incorrect noun phrases; a/an misuse; number agreement problems in noun phrases ("five machine" instead of "five machines"). Use of a possessive in place of a plural, and vice versa. Also detects omitted apostrophes in possessives. Incorrect punctuation, including commas, colons, end-of-sentence punctuation, punctuation in quotations, multiple spaces between words, or a semicolon used in place of a comma or colon. Nonstandard questions such as, "He asked if there was any coffee left? ", "Which makes an offer a good solution? ", and "She asked did you go after all?". Incorrect use of relative pronouns and punctuation, including "who" used in place of "which" to refer to things, "which" used in place of "who" to refer to people, unnecessary use of "that" with "whatever" and "whichever," or "that's" used in place of "whose." Disagreement between the subject and its verb, including subject-verb agreement with pronouns and quantifiers (for example, "All of the students has left" instead of "All of the students have left"). Incorrect verb phrases, incorrect verb tenses, transitive verbs used as intransitive verbs. Words or phrases identified as clichés in the dictionary. Sentences that contain colloquial words and phrases, including "real," "awfully," and "plenty" used as adverbs; two consecutive possessives; "get" used as a passive verb; "kind of" used in place of "somewhat"; "scared of" used in place of "afraid of"; and "how come" used in place of "why." Use of technical, business, or industry jargon. Use of contractions that should be spelled out or that are considered too informal for a specific writing style — for example, "We won't leave 'til tomorrow" instead of "We will not leave until tomorrow." Fragments that you might want to avoid in formal writing, such as "A beautiful day!" or "Why?". Gender-specific language, such as "councilman" and "councilwoman." Hyphenated words that should not be hyphenated, and vice versa. Also detects closed compounds that should be open, and vice versa. Nonstandard words such as "ain't" as well as miscellaneous usages such as "angry at" instead of "angry with." Numerals that should be spelled out (use nine instead of 9), and vice versa (use 12 instead of twelve). Also detects incorrect use of "%" in place of "percentage." Sentences written in the passive voice. When possible, the suggestions are rewritten in the active voice. Questionable but not strictly incorrect possessive usages such as "Her memory is like an elephant's" or "I stopped by John's." Unneeded commas in date phrases, informal successive punctuation marks, and missing commas before quotations — for example, "She said 'He is due at noon.'" Questionable use of "that" or "which." Sentences that include more than 60 words. Sentence fragments, run-on sentences, overuse of conjunctions (such as "and" or "or"), nonparallel sentence structure (such as shifts between active and passive voice in a sentence), incorrect sentence structure of questions, and misplaced modifiers. Sentences beginning with "And," "But," or "Hopefully"
Use of conjunctions and adverbs at the beginning of a sentence, or use of "plus" as a conjunction between two independent clauses. Strings of several nouns that may be unclear — for example, "The income tax office business practices remained the same." Strings of prepositional phrases — for example, "The book on the shelf in the corner at the library on the edge of town was checked out." Ambiguous phrasing — for example, "more" followed by an adjective and a plural or mass noun ("We need more thorough employees," instead of "We need more employees who are thorough") — or sentences that contain more than one possible referent for a pronoun ("All of the departments did not file a report" instead of "Not all of the departments filed a report"). Pronouns I and me, which shouldn't be used in scientific or technical writing. Use of indicative verb forms where the subjunctive is preferable, split verb phrases, and passive verb phrases — for example, "The pepper is able to be chopped without burning fingers." Wordy relative clauses or vague modifiers (such as "fairly" or "pretty"), redundant adverbs, too many negatives, the unnecessary use of "or not" in the phrase "whether or not," or the use of "possible … may" in place of "possible … will." Two or more words between "to" and an infinitive verb — for example, "to very boldly enter the market."